It's been years since I realized I had psoriasis on my scalp. I can't even remember a time where my scalp didn't itch or burn. It's been something I've struggled with since I was little and nothing ever quite does the trick. I've tried lots of shampoos, conditioners, creams, and treatments, but some either don't work, or they make my hair so greasy, it's not even worth it. I've tried prescriptions, high end, drugstore but nothing quite ever works. When I saw that DermaE, one of my latest favorite skincare brands (and also available in the drugstore) had a psoriasis and eczema line, I jumped at the chance to review it for all of you. I've talked before about my skin issues, but this just hit so close to home. My psoriasis is MAINLY on my scalp, and it's been getting worse and worse as of late, so why not try something new? Well, I was certainly surprised when I opened this little package from DermaE and they included lots of goodies from this specific line. 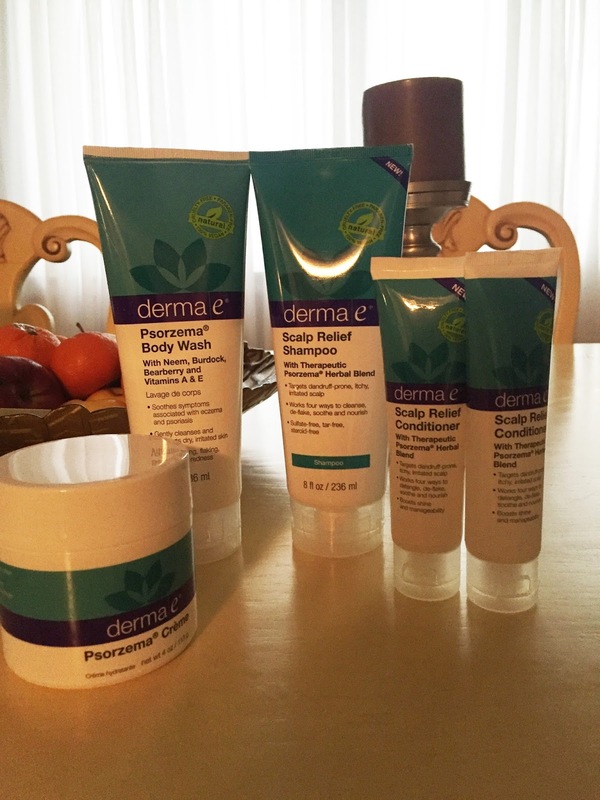 I received the Scalp Relief Shampoo & Conditioner, as well as the Psorzema Creme and body wash. 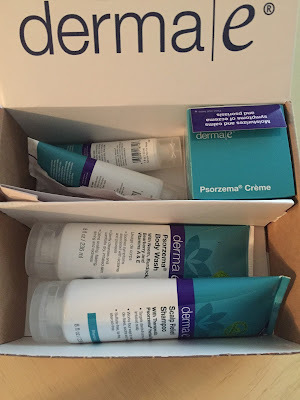 I was super excited to see the other items too because like I said, while my psoriasis is mainly on my scalp, my skin acts up from time to time. These items won't go to waste. Both the shampoo & conditioner work to detangle, deflake, soothe, and nourish the scalp & hair. They contain Salicylic Acid, Tea Tree, and Menthol and are also sulfate free (perfect for keratin treated hair), tar free and steroid free. I mean, who doesn't want all those things in a haircare line? I've used both of these products a few times and I can attest to saying they have helped. My scalp feels slightly less irritated, and my hair is definitely easier to maintain. I know that as I continue to use it, the benefits will start to reap bigger rewards. My skin hasn't been too bad lately, even though it does act up from time to time, so I haven't used the creme and body wash as much as the shampoo & conditioner, but I have used them. The unique thing about the body wash? It can be used as a face wash which would definitely come in handy if you have severe psoriasis or eczema on your face. The body wash looks like the shampoo, clear and very gel like. It feels soothing on the skin, which is always a plus. Like I said, my skin isn't acting up at the moment so I can't say whether it helps with the psoriasis but I'm guessing it would because of how soothing it is. The creme is very, very thick. This would be IDEAL in the wintertime, maybe even now that Spring is nonexistent in NYC at the moment. But anyways... this creme is super thick, and hydrating and soothing. I'm very, very impressed. I've tried a lot of eczema cremes and this is by far the best one. If you suffer from psoriasis and/or eczema, I highly consider trying this line. You will definitely find something that works for you. 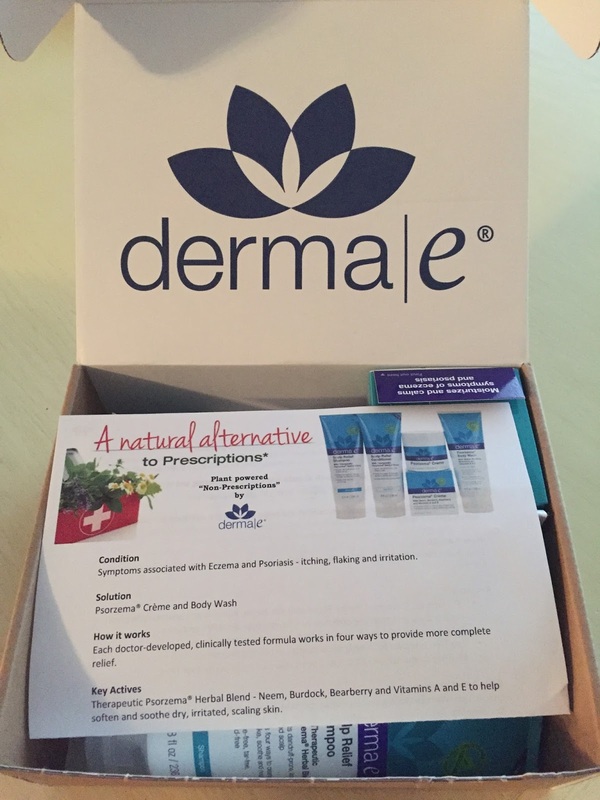 DermaE is always available at DermaE.com, your local Health Food store, Whole Foods, and The Vitamin Shoppe.